We didn't have any plans on our 2nd day in the island because we were still waiting for my sister and cousin to arrive. They came a day later because they had work. We agreed to just visit some places and do activities when the whole group's complete na. So we decided to just chill, take it slow and relax. Spent the day eating, light drinking, admiring the view (and some chicks) & window shopping! Haha. On our way to D'Mall, saw this stall selling personalized cellphone cases for P799. Ang ganda! For our first meal on our 2nd day, we decided to splurge a little. We ate at I Love Backyard BBQ in D'Mall. If you plan to eat here, avoid instances when you're already dying of hunger--because, you WILL die. Haha. There's always a line (place is always jampackled) and serving takes about 15 minutes or more. I ate Honey Mustard spareribs & I loved it! Nico ordered Porkchop something. Baduy. Haha! My meal cost P270. It's so good & serving's huge. I was not able to finish my food. Next time, will just share with Nico. After eating, we headed to the beach and met up with 2 of my cousins at Bombom Bar where there was a promo on beer! Buy 1, take 1 for P80. For a Station 1-2 beachfront bar, that's pretty cheap! :) Stayed there until nearly sunset. BFFs Nico and my cousin Chollo! Nagmomoment sila db ang cute. Haha. Super smooth and chill sounds. Love her voice! The blind man goes to Boracay. Peace haha. Ice cold beer + family & friends + live music = Perfect tambay! At around 4:30pm, we decided to transfer to Station 1 where all the pricey hotels are. Before we found the perfect sunset & OOTD spot, we stopped along the shore and ate chori burger and isaw first! Canvass pa more ng paraw! 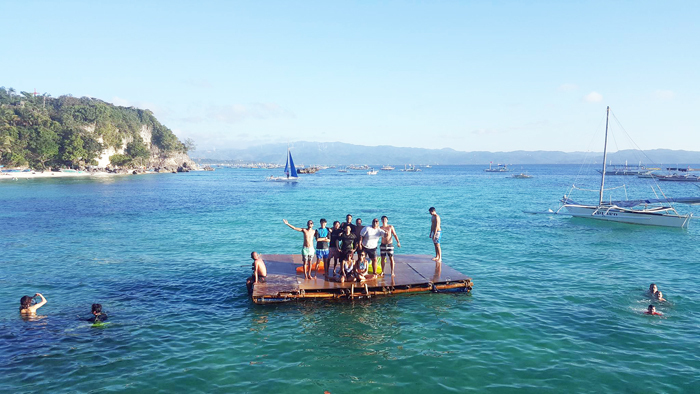 Kuya offered P2500 for 1 boat, all 10 of us na! But we didn't push through coz we were not complete. These were supposed to be Minions? San banda? Haha. Sideline daw ni Jules. Haha! Had the first-timers try chori burger! Yummy. Chori burger & beer! Perfect combo. You could also paddle board! Lalo na puro lumot this summer haha. P10 ice candy which I bought from a vendor! And here are some of my OOTD photos! Please don't judge me. Constipated galore again. Always updated & on the loop with my ASUS Zenfone 2 Laser! Bawal daw sila picturean sabi ni Kuya. Napic ko na eh. Lol. Had a hard time deciding where to eat for dinner. We eventually agreed on SMOKE! Got the fish teppanyaki for P150. It was okay! Not that spectacular but it was nice. The other didn't like their beef & mushroom. Too buttery the gravy daw. For lunch, we chose LANZ BOX in D'Mall! More restos sa stretch na to! It's an alley sa dulo ng D'Mall where cheap restos are:) You would find the 2nd branch of SMOKE here. Our P700 meal! We only paid P150 each. Not bad! After lunch, we headed to BomBom Bar again to meet up with the rest of the gang. It became their new favorite spot because of the beer promo! Haha. We left BomBom at around 4pm and headed straight to Spider House! It's one of the best places in Boracay to watch the sunset. Told them to go there early because the place gets crowded 5pm onwards. Spider House is quite far from the town proper, so we rented a SMART car or tricycle (but bigger) and paid P30 each. We also asked Kuya to pick us up at around 7pm. Convenient na din because transpo could be quite hard sa area na yun. If you want Kuya's number, message me! Haha. To go to Spider House, you must enter an alley going to Diniwid beach. Love this beach din! It's not malumot and it's pretty chill and relax here. From Diniwid, turn right and walk towards Nami resto and then you will immediately see the sign. Just follow them! Playing fetch sa water. Cute! Can you see the NAMI sign? On its left is Spider House! You must enter this cave to get into Spider! Found this secret spot sa gilid. Love it! Here are my OOTD photos from Day 3! Love this pastel one-piece swimsuit from KATS which I bought from Zalora! Fell in love with the back detail! Drinks are quite pricey. This mojito is P180, I think. There's a ladder you can use so you could go down and swim! Thanks to my sis for the photos! Kahit super laughtrip to. Haha! Ansaya ko lang db? Haha! We swam to this raft and watched the sunset from here. Beautiful! Close up shot by Ate Ping. Haha! Reality! Nadulas si biggie haha! Background: RJ is my closest cousin and Sheila is our BFF since birth. Haha! Sheila left 16 years ago to live in the US (California reprezent!) and this is the first time since then that she's been home. It's amazing how after 16 years nothing's changed. :) Will miss you na naman She! :( Love them both! We left Spider House at around 7pm and headed straight to D'Mall for dinner. I didn't want to eat Filipino food muna so we chose McDonalds! Haha. After Mcdo, we went back to the hostel to freshen up, assembled at 9pm and headed to MNL Hostel for the rooftop party! Walked from Second Wind to D'Mall! MNL & Second Wind is owned by the same people, so people from 2WBBB can go there for their events and activities. :) We were given free drink stubs! Yey! Hello, Kuya! I've missed MNL! they changed their wall art na! And then we settled! They had the vodka/sprite and I bought beer for P50. Patrick talking to our new friend Elhem (Sirin on her right)! Met these lovely ladies at the hostel and asked them to join us. We've become inseparable ever since. Haha! My Ate, Chollo (my cuz), Bhang (Chollo's gf and our childhood friend) and the jowa Nico! More chika with strangers, more fun! Us with our new friends from Second Wind! And some from MNL hehe. :) Such a fun bunch! Exchanged stories and FB accounts with some and then headed home! I had 3 beers for P50 each. Pwede na. Haha. Got a little tipsy and hungry, so we bought food from this lugawan near our hostel. Hihi. P30 goto with egg FTW! Haha. 1. Sightseeing & Tambay - less gastos if you just came to chill and relax. No activities. 3. Cheap drinks - we were able to avail free drinks when we partied at MNL. There are also promos sa beachfront bars, you just have to ask around! You could aways go to BomBom! They offer Buy 1 Take 1 beer promo for P80. Or you could go to Beach Pub at Tibraz for 15% discount (only for Second Wind or MNL guests). You will be able to save money if you just buy from local stores and drink at the hostel! 4. Walk - save on fares by walking! It's great exercise. :) Don't walk to Spider House lang coz it's far. Haha. 5. Fare sharing - you can always share a ride with other tourists or locals. Tricycle fare (for sharing) is just P10. 6. Activities - There are hundreds of people offering tours sa beach. You can always canvass & survey. Choose one who will give you the best price! Will share with you our contacts on my next post! Aside from paid activities, there are other things you could do that don't require much money, like spending the afternoon in Spider House or just chillin' at Bulabog beach! We went to the carnival before and rode the Sky Cycle and went inside the Trick Eye Museum for free! Makapag-ipon na nga ng 4k! lol! :) I enjoyed reading this post, very informative!